On our car ride out to Las Cruces, New Mexico, on our way to go visit my dad, Amanda and I took turns driving (of course, I drove most of the way) and we also took turns read out loud to each other Rob Bell's latest book, Love Wins. Prior to reading the book, we were both well aware of the controversy surrounding it. Indeed, well before the book was written, we were aware of the controversy surrounding Rob Bell himself--indeed I myself am quite intimate with the controversy since I am sometimes subject to criticism due to the influence Rob Bell has had on my theological perspective. Nevertheless, we were both excited t read the book and each of us had our own expectations and questions... will Bell write himself out of evangelicalism? Will he really deny the existence of Hell as his critics have accused him? Will the book be as controversial as it has been made out to be? I must say, after finishing Love Wins, that it's just not as controversial as it has been made out to be. Sure, for those who hold eternal damnation at the center of the gospel, this book will be a source of anxiety. But for the rest of us who, in light of the profound grace and mercy of God's love, have held loosely to our conclusions regarding punishment and divine accusation, Bell will provide noting short of a breath of fresh air. But it's clear that neither of those camps--the damnationcentric dogmatists nor the forgiveness-centric/destinationally ambiguous theologians--are among Bell's main audience. No, Bell's not talking to those who are comfortable with eternal punishment as an integral element of the gospel nor is he preaching to the choir. Bell is writing to all those who've been taught that if they can't accept a God who's willing and ready to watch people suffer for eternity in God's name, then they can't accept Jesus. Bell opens for those people the possibility of accepting Christ's message by focusing on the central claim of Christianity which is the radical proclamation that love does, in fact, win. If you expect Bell to rationalize Hell out of existence, then you'll be disappointed. If you expect him to be comfortable with the hope that all might be saved, just as Karl Barth was when he said that "the proclamation of the Church must make allowance for this freedom of grace" (God Here and Now, page 41. ), then you'll be correct in you expectation. Bell does not share this sort of anxiety and that just makes some people anxious. Bell, wants us to begin with heaven, to begin with love, and see if we can rationalize Hell from there. Bell puts at the center what belongs at the center (i.e. the hesed of God) and allows for tension where tension is due. To some, Bell might be writing his way out of orthodoxy. Indeed, he might not fit any longer into some people's molds of evangelicalism. But nevertheless, the focus of this book is quite evangelistic and quite orthodox from an historical and biblical perspective. It leaves us with an invitation to live what Dallas Willard calls "the eternal kind of life now" and to embrace Christ as our one source for forgiveness and grace. 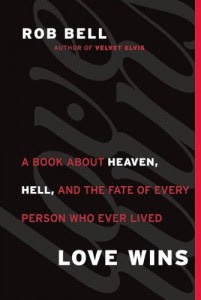 I find it to be a wonderful and accessible contribution to the ongoing discussion about "heaven, hell, and the fate of every person who ever lived." It's definitely worth the read. It's a home run! I liked that you made up the phrase "damnanationcentric dogmatists." That phrase is awesome. Beyond that, I think that you have given Bell a very fair reading. I would like to read the book, and I know that I will someday. There is such a range of human emotion and human experience that it does seem somewhat arbitrary to put them into those "heavenites" and those who are "hellites" (see! I can make up words, too). God does not seem to break people up evenly into clean and unclean. We seem to see this in the many like Cornelius and the Centurion who found themselves somewhere in between Israel and Paganism. How strange it is that those evangelicals who rake Bell over the coals on this issue, just love C. S. Lewis - who did much the same thing, years ago, in The Great Divorce! Not only could anyone leave hell for heaven if they chose, but hell was an infinitesimally tiny place in Lewis' vision, hardly the sort of thing around which to build one's theological approach. Good post, Wes! I enjoyed this book immensely! Especially the idea that your view of heaven and hell shape what you do NOW to bring heaven to earth.